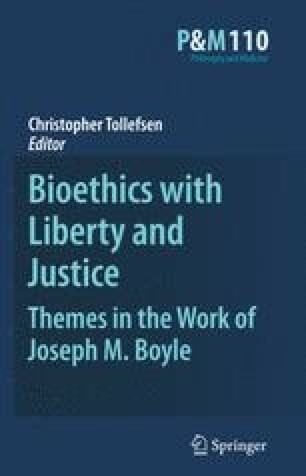 One crucial question for the Natural Law Theory of ethics that has been advocated by Joseph Boyle over the course of his distinguished career is: Exactly what is to count as (minimal) respect for a good or value? Under what circumstances do we fail to reach the threshold even of respect for some good, and so count as violating it? I take this to be the hardest question of all for the New Natural Law Theory; it is obvious from Boyle’s writings that he takes it to be a crucial question too, and that he has done more than most to clarify it. Howard-Snyder, F. 2002. Doing and allowing harm. Stanford Encyclopedia of Philosophy. http://plato.stanford.edu/entries/doing-allowing/. McIntyre, A. 2004. Doctrine of Double Effect. Stanford Encyclopedia of Philosophy. http://plato.stanford.edu/entries/double-effect/. Mill, J.S. 1872. A System of Logic, 8th edition. London: Online Library of Liberty. http://oll.libertyfund.org/index.php?option=com_staticxt&staticfile=show.php%3Ftitle=246&Itemid=27.